What can give a luxury watch even more luxury better than diamonds? A watch with diamonds is a watch that exudes all that is luxurious whilst accentuating the quality of the watch. Naturally, diamond watches also glitter in light in a way that is both eye-catching and captivating. Diamonds can be set in the bezel or encrusted on the dial itself, with very often small diamonds being used as sparkling effect to denote the hour markings. But, although diamonds may be a girl’s best friend, they are also used to superb effect in men’s watches. 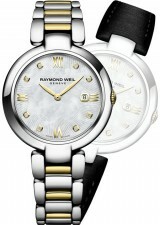 Anytime has an impressive array of diamond watches for you to choose from. Diamonds can certainly bolster the investment potential of a quality watch - and raise the design aesthetic and appeal of the watch to another level.